It’s Time to Play Where’s My ‘Alderman’! OR … Play from your favorite armchair if you don’t live in Chicago! The Chicago Clean Power Ordinance that would cut harmful pollution from the two coal plants in Chicago (or shut them down) now has enough support to pass City Council. A committee hearing on this groundbreaking ordinance will be held on April 21. Chicagoans are looking to Mayor Daley to allow a vote on the ordinance before he leaves office mid-May. If passed, Chicago would be the first city in the country to regulate emissions from coal plants! However … Chicago Alderman have a way of disappearing just before an important vote – or not showing up at all! It’s time to show City Council that politics as usual won’t be tolerated. Each alderman knows you’ll be watching and twittering about their performance – good or bad – on this landmark legislation! How to Hold the Alderman Accountable! Join Eco-Justice Collaborative and the Chicago Clean Power Coalition as we attempt to open the lid on the workings of the joint committee hearing and shine a “virtual” light on the operations that seemingly work only with Mayor Daley’s permission. We invite you to “quote” and “re-tweet” about the positions and whereabouts of committee members. Where do the alderman stand on the issue of protecting the health of Chicagoans from harmful air emissions? Are they undecided? Hoping the issue goes away or do they have political courage? Where are they on the day of a hearing to consider a critical measure that will protect their constituents? Too busy with other things? Hiding? OR are they fully present and engaged? If they do their job, we hope to make them look good. If not, we hope to embarrass them with messages from around the world. 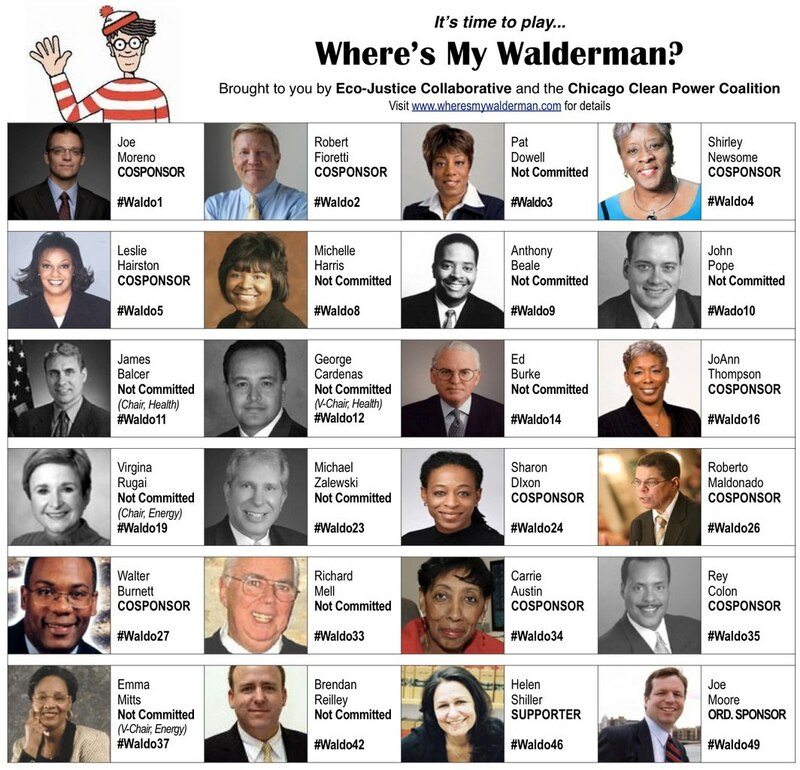 You can track the presence (or lack thereof) of each of the 24 alderman on the joint committee by watching the tweets on EJC’s “Where’s My Walderman?” website which will go live tomorrow morning and include live streams under photos for each alderman. If they are not present, their photo will be placed with a “waldo” image. Visit the landing page today to watch the tweets that are already coming in. Clicking on their name or photo from this “soon to go live” will take you to their ward page on the City Council website. Make calls to support them, or to pressure them to show up to the hearing! Tweet using their specific #hastag to have your thoughts show up in their individual Twitter stream. Re-tweet others’ thoughts. Play along! 1. All you need is a computer or a mobile phone. 2. If you don’t have one, go on line and get a twitter account. It’s easy and free! 3. If you can, join us in the City Council Chambers on Thursday, April 21st at 10:00 am. You can tweet directly about the issue and your observations. 4. If you can’t be at the hearing, watch this page. Each alderman has his or her own Twitter stream. Join in with your comments. Tweet, re-tweet and spread the word to your followers. 5. Use the hashtag #chicoal for the general stream. Use both #chicoal and the alderman specific hashtag #waldoX (where X = the aldderman’s ward number, i.e. #waldo49 for Alderman Joe Moore) for committee members. 6. Pass the information along to other social media networks. Invite others to join you! Let’s communicate with the world! Which aldermen would want to be recorded as having decided NOT to be present to vote on this historic legislation that would protect the health of their constituents? We’ll just have to see, won’t we? Need Background on the Ordinance? Visit the Chicago Clean Power Coalition’s website. Read Jeff Bigger’s Huffington Post article to see how things are heating up: C-Day Twitters: Will Chicago Aldermen Make Clean Energy History Or Disappear into Big Coal’s Shadow Tomorrow? AND you can watch this short video clip from WTTW’s Chicago tonight that aired April 19, 2011. May Delegation to America’s Heartland!